Atlanta Men’s Roller Derby was founded in the fall of 2012 and has grown into a competitive team with our first home bout this Saturday March 15 at the Cobb Civic Center. 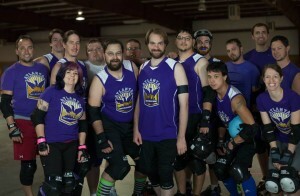 I’m Sharc, #34 with the Atlanta ResurGents. I’m lucky to have been a part of roller derby the very first time men’s derby exhibitioned in Atlanta, during the intermission of the 2007 ARG Championship Bouts. 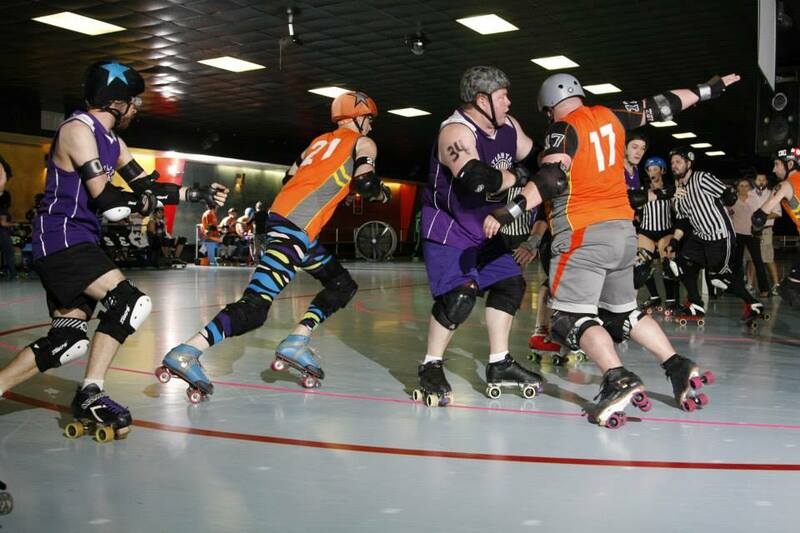 Unlike the bulk of our roster, I had no specific ties to derby before I tried it. I was just a fan who answered the call for interested men to be a part of the exhibition. I spent most of my formative years on quads. I thought it would be easy! I was wrong! Fast forward to 2012 – interest had finally grown enough that several officials decided to form a men’s team. DJ Jazzy Ref helped found the league with officials like Duke Skellington, Man/Child and several others, working out an agreement with ARG to use their practice facility. Once the word was out, Shannihilator, our former coach, mentioned to Jazzy that there were some men who had expressed interest seven years before. 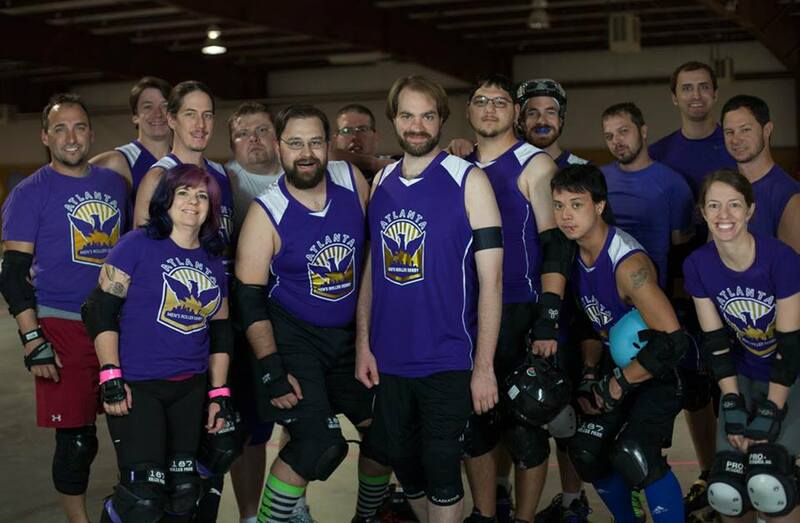 AMRD’s current roster consists mostly of referees, officials, coaches, boyfriends, and husbands of women’s roller derby participants from all over North Georgia (Atlanta, Athens, and Marietta). Quad Father and I were the only two left from the initial exhibition who responded with a desire to play. Unfortunately, the last seven years hadn’t been kind to me – I had gained weight and was in poor physical condition. I was 39 years old, and I could barely skate through half a practice. Using derby as my motivation as well as a strong desire to become more physically fit, I lost twenty-five pounds skating. Roller derby had evolved so much in seven years that I not only had lose weight, but also had to improve my skating skills and learn strategy. My wife was concerned for my safety. I falsely assured her that I’d be the guy doing most of the hitting and that I “wouldn’t get hit much.” During our first full scrimmage with the Carolina Wrecking Balls, I broke my wedding ring in half right in front of her! In our second bout versus Harm City, I earned my first black eye knocking a jammer out of bounds. Luckily, my wife continues to be my number one fan despite witnessing those physical side effects. 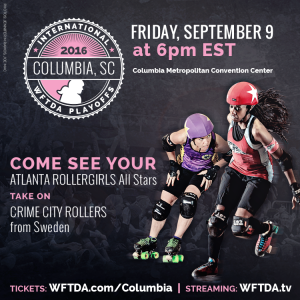 She now realizes roller derby is a “take and give” sport, and she sees how important it has become to me. She knows my Sunday evenings are reserved for practice, and she doesn’t wince anymore if I come home with a black eye. 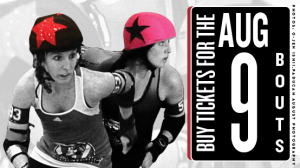 Come see us in action as The Atlanta ResurGents host the Greenville Atom Bombs Saturday March 5th as part of a double header with the Marietta Derby Darlins at the Cobb Civic Center at 4pm. The men’s bout starts at 6pm. Tickets are $12 at brownpapertickets.com/event/552591.